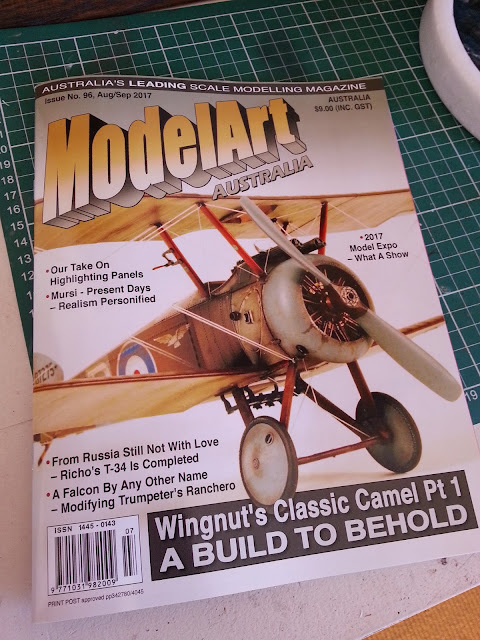 Rather exciting news - I've got a four page article on panel line washes in the latest release ModelArt Australia magazine. It is my first ever magazine article. ModelArt Australia, issue 96, August/September 2017. For those of you in Australia, the magazine is fairly easily found. For international readers, I'm not so sure... Sorry. I can't share any information from the article at this stage, but once the next edition comes out I have permission to re-publish my article here on my blog. But in the meantime, if you have funds available and can see your way to buying the issue and supporting a local modelling endeavour, that's a great thing to do. If money is tight, and I understand for a lot of people it is, then just keep enjoying my free content as always.